Patronage of the San Diego Central Library has more than doubled since the landmark facility near Petco Park opened to the public one year ago Tuesday. Over the past year, attendance at the new nine-story facility on Park Boulevard totaled approximately 1 million people, compared to 456,000 in the final year of the old location on E Street, according to figures provided by the San Diego Library Foundation. Circulation figures are also believed to be doubled, but the numbers aren’t final. About 3,000 people per day are using the 550,000-square-foot Central Library, and 45,000 new library cards have been issued in the past year. The $185 million library was built three decades after city officials determined the old building was becoming obsolete. Funding problems, delays in finding a site and debates over whether a big main branch was necessary in a sprawling metropolis during the Internet age combined to slow the start of the project. 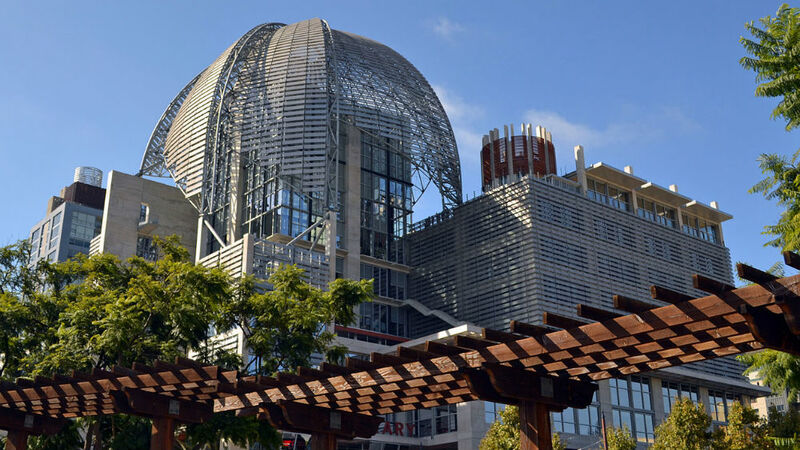 The Central Library concept was eventually boosted by East Village development, the population growth of downtown, fundraising by the library foundation and a deal with the San Diego Unified School District to place a charter high school on the upper floors. The facility includes a 350-seat auditorium, a three-story domed reading room, a children’s room of around 9,100 square feet, a teen center, a technology center and a multi-purpose room. It also features an outdoor garden courtyard and cafe, 250 parking spaces on two levels, and dramatic views of downtown and San Diego Bay. The library foundation plans to host a gala on Oct. 10 at the library to raise funds for technology and programming at all library locations. Information is online at supportmylibrary.org/celebration.